As a remote employee, I’ve found a lot of ways to keep myself on a regular schedule, focused on the task at hand, and well-socialized. I even wrote a blog about working remotely earlier this year that helps showcase the ins and outs of shifting from home office to coffee shop and back again. Working remotely is as good as it seems, but there’s always room for improvement. 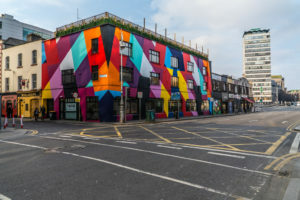 To help make this good thing better, the Ketner Group executive team has arranged a coworking membership for me at one of Dublin’s more recognizable and funky places of work, The Tara Building. Located right in the heart of the city, a stone’s throw from Trinity College and across the road from the Irish Times headquarters, it’s a great environment to settle in for a few hours and get some serious work done. The open floor plan and floating desk environment make it a casual space to work, and it’s easy to catch the productive vibes from pros in other industries. Chats in the kitchen range from technical design concepts to Irish politics to the next great vacation spot or new restaurant to try. Weekly workshops on everything from leadership to Chinese Art make it impossible to feel like there’s a lack of innovation or culture in town. All of it combines to keep the creative juices flowing, and there’s also the opportunity to network just a walk downstairs away. Working remotely allows for an unrivaled sense of control over schedule, location and wardrobe. It means if it rains, hard, I’m not going anywhere and that’s just fine. But it also means that I have a unique opportunity to work alongside professionals from across the world, from a wide number of industries on a day-to-day basis and expand my perspective into how the world really turns.